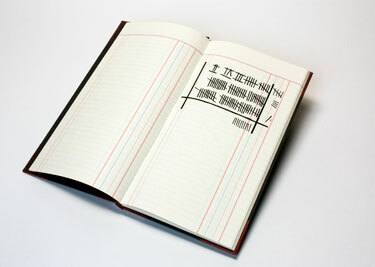 De Rekening is a work built upon an artist-created system of "fake writing" used to mark the passing of time. 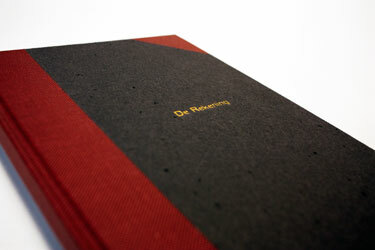 Inspired by the anonymous entries in 19th Century ledgers and account books, De Rekening borrows its form and repetitive structure from those utilitarian yet evocative receptacles of time. 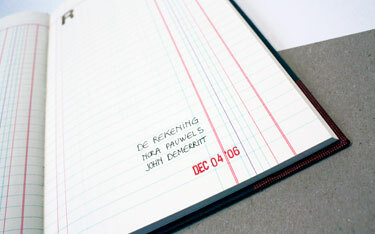 The ruled lines in the book were mechanically drawn using a pen ruling machine at Golden Business Forms in West Burlington, Iowa, especially for this edition. 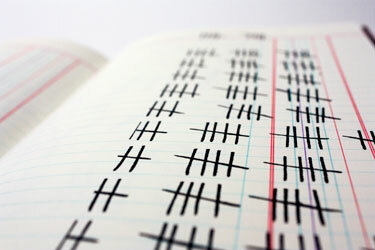 Pen ruling was widely used in the 19th and early 20th Century in the ledger and account book trade; Golden Business Forms is one of the last purveyors of this technology. Bound in Japanese buckram with stamped title, the book was letterpress printed by the artists at the Center for the Book. John DeMerritt operates a bindery in Emeryville specializing in small editions and boxmaking. His client list includes many well-known artists, photographers and galleries. He has taught at the San Francisco Center for the Book, the Kala Art Institute in Berkeley and currently teaches bookmaking at the San Francisco Art Institute. He is married to printmaker Nora Pauwels, with whom he collaborated on De Rekening. Nora Pauwels is an internationally recognized printmaker. Originally from Belgium, where she was educated in fine arts and fine art restoration, Pauwels is notable for her exploration of unusual means of creating intaglio prints, such as using the Dremel tool with various plexigravure processes. Pauwels has been actively involved with the Kala Art Institute in Berkeley, where she has created several portfolios of prints that have been collected both nationally and internationally.